The Golden Compass is the first book in the His Dark Materials trilogy. I started reading it with my son, but ended up finishing it on my own after realizing it’s a little too mature for a nine-year-old. “Lyra is rushing to the cold, far North, where witch clans and armored bears rule. North, where the Gobblers take the children they steal–including her friend Roger. North, where her fearsome uncle Asriel is trying to build a bridge to a parallel world. The Golden Compass is an epic adventure that begins in a parallel universe at Jordan College in Oxford, England. Lyra is a twelve-year-old girl who lives at Jordan College with her daemon Pantalaimon. Every human has a daemon, which is a physical representation of the human soul. The daemons of children can change forms, but once the child becomes an adult the daemon remains in the same form. She was left at Jordan College by her Uncle Lord Asriel, a military leader. Lyra’s best friend is a kitchen boy named Roger Parslow, who goes missing. There are many missing children, and Lyra believes they’ve been taken by The Gobblers. One day a politician named Marisa Coulter comes to Jordan College talking about a trip North. Lyra knows her Uncle Lord Asriel has gone North and wants to find him. She agrees to go with Ms. Coulter and be her assistant. Before she leaves she’s given an alethiometer (the golden compass), and believes it is her mission to give it to her Uncle Lord Asriel. With the help of Farder Coram and John Faa, Lyra travels to the North where she meets new friends like an armored bear named Iorek Byrnison, balloonist Lee Scoresby, and my favourite character, witch queen Serafina Pekkala. I wanted more about her, and am hoping the next book gives me more of her back story and life. Although Lyra is brave and smart, she’s also a spoiled brat without manners. The characters felt flat to me, lacking personality, and desires, I just couldn’t connect with them. The writing itself is stunning. The world-building is pretty good, although there are some things left unexplained (such as daemons). The plot is relatively fast-paced, creating an exciting story that had me hooked from the beginning. There’s a lot of debate about the anti-religious themes. A nun in the book does say Christianity is a “powerful mistake”. In interviews Pullman has said things like he is trying to undermine Christianity through his work. The Golden Compass is about the search for Dust, which basically represents sin. Children have no “dust” on them, while adults do. The villains in the book are trying to find a way to prevent Dust. Does this novel have anti-religious concepts, yes, however, I feel like it didn’t add or take away from the narrative. The main problem with this book is that it is too mature for kids, yet immature for young adults. 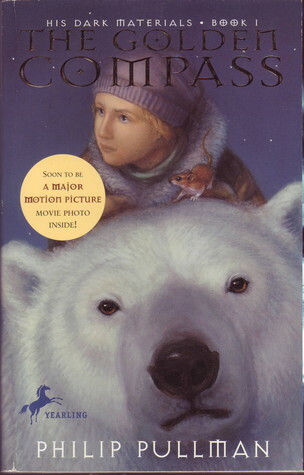 Imaginative, exciting, whimsical, The Golden Compass is a great fantasy novel about spirituality, morality, the human soul, and science versus religion, that I recommend to anyone fourteen-years-old+ who like a plot-driven story with an unlikable protagonist. “In 1946, acclaimed author Philip Pullman was born in Norwich, England, into a Protestant family. Although his beloved grandfather was an Anglican priest, Pullman became an atheist in his teenage years. He graduated from Exeter College in Oxford with a degree in English, and spent 23 years as a teacher while working on publishing 13 books and numerous short stories. Pullman has received many awards for his literature, including the prestigious Carnegie Medal for exceptional children’s literature in 1996, and the Carnegie of Carnegies in 2006. He is most famous for his His Dark Materials trilogy, a series of young adult fantasy novels which feature free-thought themes. The novels cast organized religion as the series’ villain. Pullman told The New York Times in 2000: “When you look at what C.S. Lewis is saying, his message is so anti-life, so cruel, so unjust. The view that the Narnia books have for the material world is one of almost undisguised contempt. At one point, the old professor says, ‘It’s all in Plato‘—meaning that the physical world we see around us is the crude, shabby, imperfect, second-rate copy of something much better. I want to emphasize the simple physical truth of things, the absolute primacy of the material life, rather than the spiritual or the afterlife.” He argues for a “republic of heaven” here on Earth.